Do you have chronic illness? Yes? You’re a liar. I’m a liar, too. The problem with chronic illness is that it’s just that…chronic–always with us. If you could talk to your old self, the you before your illness, your old self would be freaking out about all the symptoms you’d be describing and extremely sad about how drastically life will change from pre-disease to where you are now. You see, it’s generally a gradual onset. A symptom starts. You are forced to deal with it. You learn to manage that symptom and/or live with it. Slowly the symptom may worsen with you barely noticing it. Or, another symptom starts. You deal with it in addition to the previous one. You learn to manage that symptom and/or live with it. It’s a vicious cycle to which you adjust. Your “normal” is no longer what it was pre-illness. You develop a “new normal.” Your pain scales get readjusted. What would have been an 8 pre-illness on a 1-10 pain scale, with 10 being the worst pain ever, becomes a 5 for example. Therefore, when family, friends and coworkers (especially coworkers) ask how you’re doing, your response may be “Fine,” or “I’m doing okay considering.” That’s called minimizing. We all learn to minimize our situation. It’s not always like that or like this for every person, but from my own experience and those I’ve chatted with in support groups, it’s a pretty common thing–minimizing. 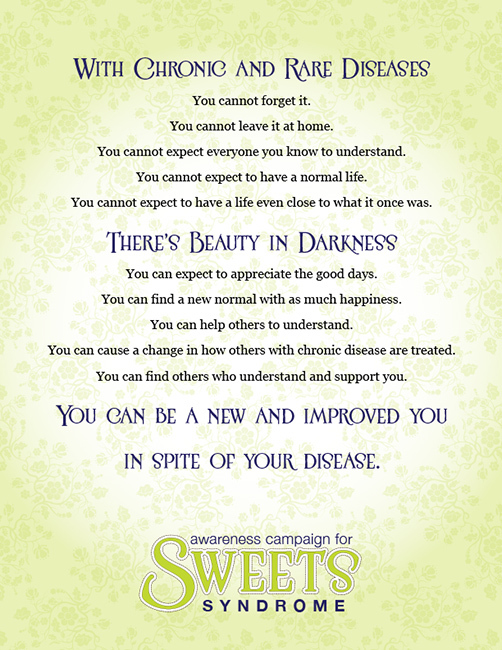 I have either Urticarial Vasculitis or Sweet’s Syndrome depending on which set of doctors you ask. I minimize and lie all the time. Not everyone needs or really wants to hear exactly how you’re doing. It’s a long, complex story to retell and explain over and over again. Most symptoms aren’t visible to others. So, we can have some sort of a feeling of our “old normal” by not saying much. No special treatment. The more we tell everyone about our symptoms, the more we think we sound like whiners or complainers. It’s a bit of an escape from our internal realities. There’s nothing completely wrong with minimizing–lying. It’s a way to cope with social situations. It can be problematic when family, friends or coworkers make a request of you that your old self would have been able to do without problems. Their expectations are too high for your “new normal.” So, you’re stuck with pushing yourself too far to accomplish or accommodate them, or you must go into that long explanation of why you cannot honor the request. The key is to set expectations. For example, I make plans with friends or family and occasionally remind them that all plans are tentative with me until about an hour before we are to meet/leave. I try to keep them updated on how I’m feeling, especially if symptoms seem to be flaring. I might text a brief warning and let them know when I will send another update. We can get lost in the routine of it. We can forget how we were really feeling when we recap our days to our health providers. We may start to lie to ourselves because we’ve lied to others. In other words, our memories typically aren’t what they once were. So, when we’re sitting in the clinic or hospital trying to give a timeline of of our symptoms, we can have false memories because we’ve minimized how we’ve felt to others. Then, we minimize our symptoms to our health providers. This is why journalling is key (Patient Journal). It’s also why the daily scale diary is so important. I’ve Always Been Crazy, But It Keeps Me From Going Insane.